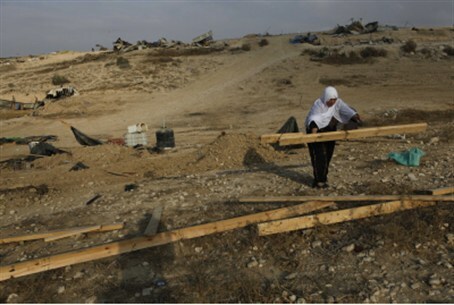 Knesset approves the first reading of the bill to legalize Bedouin settlement in the Negev, Arab MKs tear up the bill. The Knesset approved on Monday evening the first reading of the bill that will legalize pirate Bedouin settlement in the Negev, but not before a heated debate during which the Arab MKs got up to the podium and tore up the bill. The plan, which was proposed by former Minister Benny Begin just before the last elections, will add more Bedouin settlements to the list of those that will receive official recognition, and increase the amount of land that will be handed over to Bedouin as part of an agreement. Begin, who met with about 600 Bedouins and with representatives of various leftist organizations that advocate in the Bedouins' favor, recommended allowing the Bedouin to receive ownership of about 180,000 dunams of land (45,000 acres) that is registered in the name of the State of Israel. In addition, they will be eligible for 62.5% of land that they claim is their own, but for which they have no proof of ownership. Instead of receiving financial compensation for land claimed by the state, they can be compensated with alternative land, according to Begin's offer. The first reading of the bill on Monday passed by a majority of 43 MKs who voted in favor and 40 who voted against, but it was preceded by a heated discussion during which the Arab Knesset members, who are opposed to the plan, took the podium one by one and condemned it. Some of them went as far as tearing up the bill and were subsequently removed from the plenum. MK Ahmed Tibi was not satisfied with the symbolic act of tearing up the proposal and also poured a glass of water on the torn paper. The Arabs object to the part of the plan that calls for Bedouins who have no proof of ownership to be forced to leave their homes and be given alternative land. They view this as a "transfer" of Arabs. In response, Culture and Sport Minister Limor Livnat (Likud) stood up and called Barakeh “insolent.” Barakeh responded by saying, "Shut up", and Livnat said, "Do not talk to me like that." Some members of the coalition were absent from Monday’s discussion because they too oppose the plan, which basically legalizes the Bedouin land grab in the Negev and offers them far-reaching concessions. The plan was described by opponents in the pro-Jewish settlement NGO Regavim as "an historic mistake." The NGO noted that former Minister Begin only met with representatives of the Bedouin before submitting his recommendations. Meanwhile, Knesset Speaker MK Yuli Edelstein (Likud), who led the heated debate in the plenum, announced that he plans to file a complaint against the Arab MKs who tore up the law. MK Dov Khenin (Hadash) responded by saying, "You said Barakeh violated the provisions of the Knesset, but it is actually this law that violates the provisions of the Knesset. It degrades the Knesset."